hostility or social withdrawal there would be a possibility of self-destructive behavior. Imagine: Michael has just seen his reviled brother, Tommy, and his flirtatious ex-girlfriend Martha Moxley, cavorting together at the side of his own home, in the presence of everyone. She turned him down to hang out with his older brother. It is hard to imagine how such a spectacle would not have made him both increasingly depressed and overtly hostile. From the time-line: 9:15 pm--According to Tommy Skakel, from his interview on 10/7/93 [footnote 1] with Willis Krebs, at approximately this time he left the sun porch area and went outside to the side of the house to retrieve a tape cassette from his parents car. Inside the car, Tommy encountered Martha Moxley, his brother Michael, Helen Ix, and Jeffrey [Geoffrey] Byrne, who were all listening to music. Soon after, he and Martha would move to the area around the shed, off the driveway, and begin "making out." Martha's friends reportedly left shortly after this point because they found Martha's behavior to be embarrassing. Clearly, her activity with Tommy was purposefully demonstrative. It seems likely, as well, that Martha's young friends were disturbed by the inherent awkwardness of watching Martha blatantly and immodestly courting the affection of her ex-boyfriend's older brother in her ex-boyfriend's presence. We know practically nothing of how Michael reacted to all this, and it is a glaring omission. For certainly, he had a reaction, and it may have been extreme. 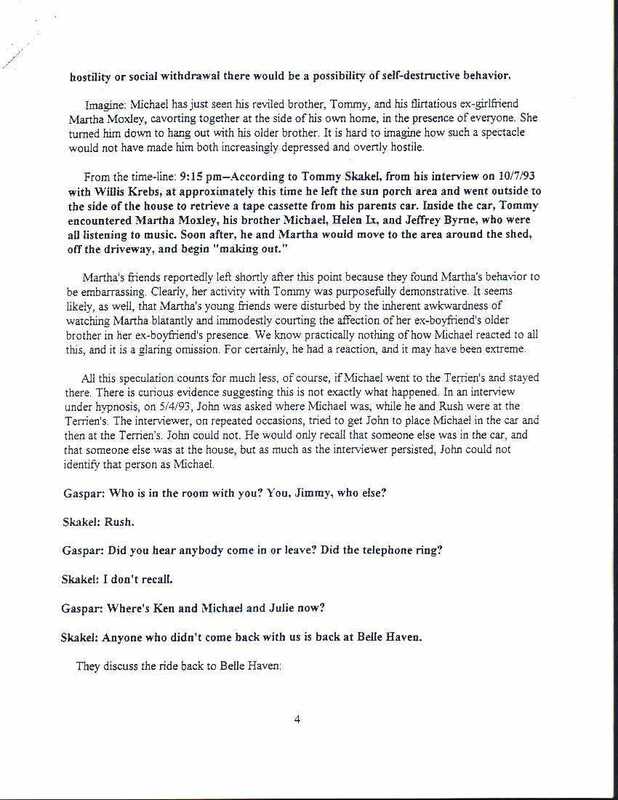 All this speculation counts for much less, of course, if Michael went to the Terrien's [Terriens'] and stayed there. There is curious evidence suggesting this is not exactly what happened. In an interview under hypnosis, on 5/4/93, John was asked where Michael was, while he and Rush were at the Terrien's [Terriens']. The interviewer, on repeated occasions, tried to get John to place Michael in the car and then at the Terrien's [Terriens']. John could not. He would only recall that someone else was in the car, and that someone else was at the house, but as much as the interviewer persisted, John could not identify that person as Michael. Gaspar: Who is in the room with you? You, Jimmy, who else? Gaspar: Did you hear anybody come in or leave? Did the telephone ring? Gaspar: Where's Ken and Michael and Julie now? Skakel: Anyone who didn't come back with us is back at Belle Haven.